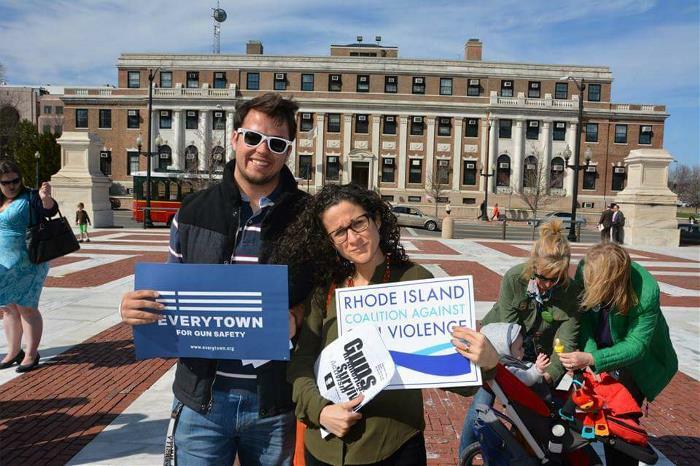 Noah Fitzgerel '17 and Rabbi Dardashti stand up against gun violence at a rally in downtown Providence. The topic for 2014-15 was gun violence. We explored the issue from both a faith-based and universal perspective and had the opportunity to hear from a variety of voices that connected to this topic. A Call to College Students: Prevent Gun Violence - Huffington Post piece by committee member Noah Fitzgerel '17. 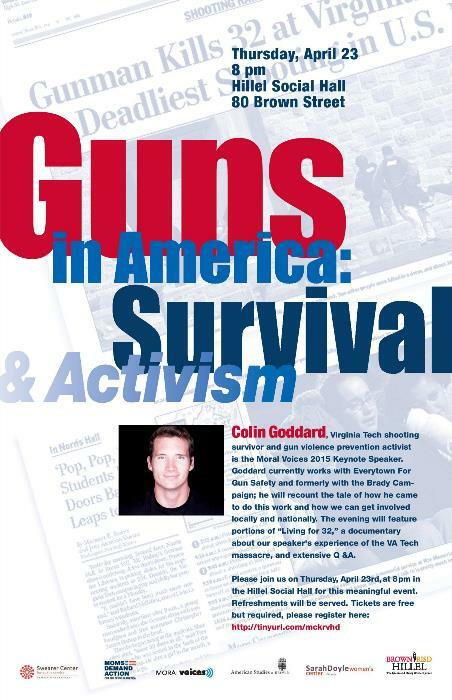 Colin Goddard, Virginia Tech shooting survivor and gun violence prevention activist is the Moral Voices 2015 Keynote Speaker. Goddard currently works with Everytown For Gun Safety and formerly with the Brady Campaign; he will recount the tale of how he came to do this work and how we can get involved locally and nationally. The evening will feature portions of “Living for 32,” a documentary about our speaker's experience of the VA Tech massacre, and extensive Q&A. Join us during this Shabbat of Passover, the holiday of freedom from oppression, to hear from Teny Gross, Executive Director of the Institute for the Study and Practice of Nonviolence, based in Providence. Services and dinner are open to students, faculty, staff, and community members of Brown and RISD. Please join us! Our panel explored the intersections of mental health and gun violence. 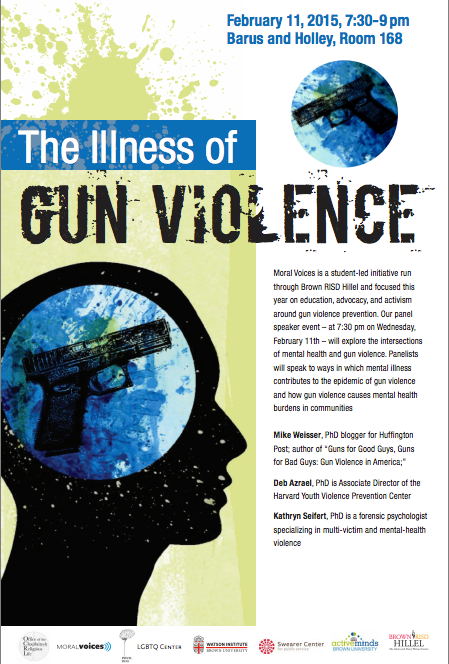 Panelists spoke to ways in which mental illness contributes to the epidemic of gun violence and how gun violence causes mental health burdens in communities. Panelists who spoke to this bidirectional relationship: Ronald Gross, MD, a trauma surgeon with experience treating patients with violent injuries and soldiers wounded in combat, Deborah Azrael, PhD, a public health and health policy researcher who's surveillance system has led to predictors of neighborhood violence and youth injury-related outcomes, and Mike Weisser, PhD, a gun industry expert who has written prolifically about gun violence in the US. Light refreshments will be provided. 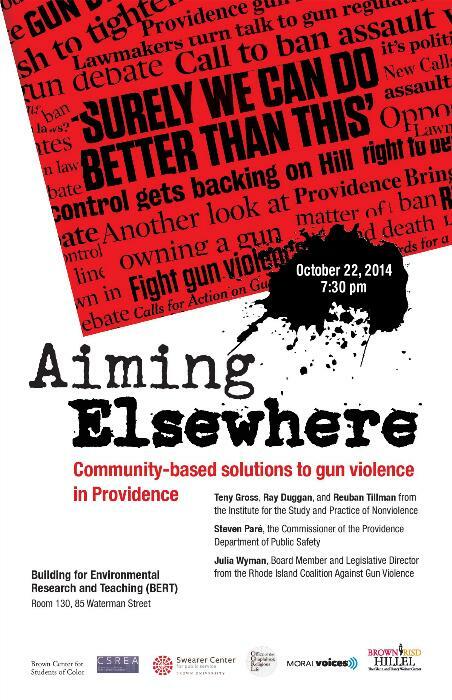 Interdisciplinary panel disccussion featuring prominent local panelists explored this topic in a forum titled "Aiming Elsewhere: Community-Based Solutions to Gun Violence in Providence. The panelists were Teny Gross (executive director of the Institute for the Study and Practice of Nonviolence), Ray Duggan (nonviolence advocate, former gang member) Rueben Tillman (nonviolence advocate, former inmate convicted of second degree murder), Steven Paré (Commissioner of the Providence Department of Public Safety) and Julia Wyman (board member and Legislative Director of the Rhode Island Coalition Against Gun Violence).